One of the worst things you can do to your FICO score is close the wrong credit line. In most cases, a credit line with a long good history is the last credit line you want to close. Credit cards with the longest positive history have the greatest positive affect on your FICO score. What if: I want to close a line of credit but it still has a balance? If you have a credit card and don’t want it anymore, simply pay it off and leave it alone. 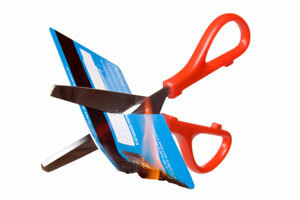 If you close a credit card with a balance still remaining, it looks bad for you – like the creditor cut you off. The FICO report reads that as ‘closed by credit grantor’, and that looks bad for you. If you must close the account, pay the card off first. I want to close a line of credit because I think I have too much available credit. If you want to close an account because you think you have too many and you fear a lender will think the same, choose carefully. Look at closing the newer cards first as they have the least time active. Then look at closing the gas and retail store cards because they are the lowest FICO scoring priority. I want to close a line of credit because of the spending temptation. If you want to close an account that you paid off for fear you will be tempted to spend again, just cut up the card (or hide it) and pretend you don’t have it anymore.